A short smooth bob and the Kanjeevaram! Tousled curls and a Venkatgiri! Blonde streaks and a Coimbatore cotton!! Well, as much as you may try, hairstyles when in discordance with the saree you desire to wear will always make you chew on your nails with anxiety. Considering how often we need to dress up for parties in sarees, and worry ourselves sick about how to match our tresses with a style, we sure could do with some quick-fix ideas. We could truly do with some quick fix ideas that will reduce our stress. Let’s get one thing straight right at the beginning-when one dresses for a party, we are always trying to make ourselves look way above ordinary –we crave for super glamorous looks, while our hair maybe anything but that! 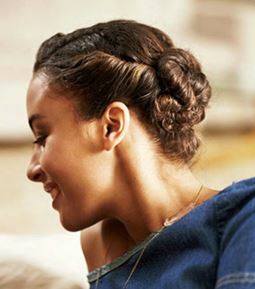 We end up opting for practical plaits, short bobs and keep taming our hair to keep everyday life hassle free. So how do we blend in the right look of our very ordinary hair to make the beauty of the saree come alive? Here are some of the most simple and nifty styles that can be easily tried out with varying lengths if hair. I will of course like to split the styles into two-the ones suited to long hair and the second lot that would be easier when tried on short and medium length. This is one style that is ever popular because of the ease that it gives to those with slightly wavy hair. It’s easily styled at home with a blow dryer and curling brushes. To get the look even better, use light golden temporary streaks to highlight. As fabulous to look at with sheer chiffons as it is with heavier sarees. Do remember though that an outdoor event may not be the right place to try this style, unless packed in well with firming hair sprays that takes away the natural bounce . Easy on faces that are heart shaped and for those who have delicate features, this is another hair style that just needs gentle blow drying and the use of curling tongs to give half the length of the hair some soft curls. Looks as ravishing with softer hued sarees as with heavier ones, as it helps tone down the look making the appearance fresher. The advantage with this style of course is the ability to wear great looking danglers and even flowers in your hair if you so desire. I love the fact that this is one of those styles that blends in certain modernity with one’s looks. The saree that would fit in perfectly with this of course is a chiffon or a delicate tissue, and would look great helping to soften the look of the unruly hair. The beauty of this hair-do is in the volume that it can create with your hair, something that people with more scanty growth can use. It makes the features look mellow, and is refreshingly un-poised, yet demure. It’s the perfect way to enhance your slender neck, and give more height to those who need it. This bun can be easily made with a puff and some hair extensions to give more length to your strands. Once the hair is piled up-it’s all about smoothening and rolling it. A hot favorite for those occasions when the glamour quotient needs to be high. It’s the kind of style that will help highlight the back of the blouse especially if it’s one of those whose design would grab eyeballs. Casual yet chic, a tweaked style that spells simplicity with an ethnic twist. The braid has always been the connection with one’s traditional past when adding flowers in one’s braids was the common thing to do. The newer avatar sees the fish tail braid that is taken on one side leaving one side of the face completely in profile, while at the same time, the loose sweep on the side allows the face to retain its softness. A perfect match with casual dinners and family get together when you don’t want to look way too glamorous, yet maintain a style your own! Tiny jhumkas and balis look best with this style. A simple way to add more volume to your hair is the layered look and for all practical purposes this style is perfect for those women who find long hair a bother. This style can be made to look all the more glamorous with a simple side sweeping with blow drying that helps frame the face most beautifully. 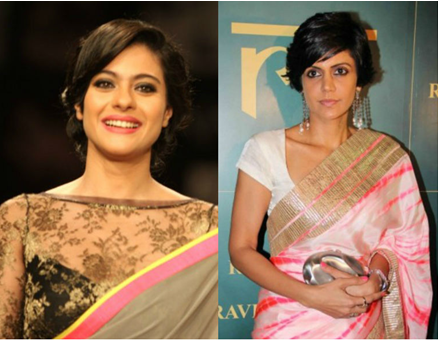 It is not unknown for Indian women to radically get their hair cut real short which does not mean that saree wearing will be tougher for them. In fact the gamine charm of one’s face is highlighted more accurately and the delicate bone structure of the face and neck too looks ravishing. On needs to however pay more attention to posture, perfect cut of the blouse and the manner in which the pallu is draped. The fringe does add that retro look while the clean lines of the swept back hair would look wonderful with boat neck blouses. This could be managed easily with shoulder length hair with ease. With short hair that is up to the nape of the neck the sweep can work as well. Long chandelier earrings or chunky studs look alluring with this hair do. Yes-you don’t need to tame those gorgeous curls –they are pretty as they are. Learn how to keep them frizz free and that should be enough. Simply curl the strands from the sides and take it to the back of the head and then take the rest of the hair making a neat little coil that you would easily go round, pinning into a larger coil. Neat and fuss free, it gives you a simple style that looks classy and formal, but at the same time bringing out the beauty of your glossy locks. It is true that there is no dearth of attitude in short hairstyles. Thus maximizing on what short hair inherently possesses, simply needs one to tweak one’s curls to frame the face in the most romantic manner as in this style. Here the hair has been swept from the crown backwards, while the side partition has helped frame half the face leaving the other half displaying a perfect profile and an even more perfect pair of earrings. 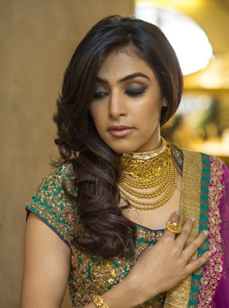 This style would look lovely with Parsi Gara sarees, chiffons and crepes, for a super svelte finish.